Why choose embroidery as a means of expression? Stitching and fabrics are an innate part of my life. They form the perfect medium for me to work with because embroidery, as a ''Slow Art'' form gives me time to think and re-evaluate the work. The lengthy process of stitching becomes a process of meditation, where ideas can change from the initial drawings that are worked from the subject of inspiration. The experience of working on a focused area, underneath the needle of the sewing machine, playing with the flow of colour and texture on a small area, working to the rhythm of the moving parts of the machine is very meditative and takes over. However the constant re-evaluation of the work opens up a process of connection and development, a personal translation. In 1978 I was introduced to a contemporary view of embroidery while attending a college certificate course in machine embroidery and design at The London College of Fashion. This lead me to taking a B.A.Hons Degree in Embroidery/Textiles at Manchester Metropolitan University from 1979-82. Since leaving university I have been working as a free lance textile designer, collaborating with fashion and interior designers, producing embroidery designs for mass production, and part-time teaching at The London College of Fashion for 12years. 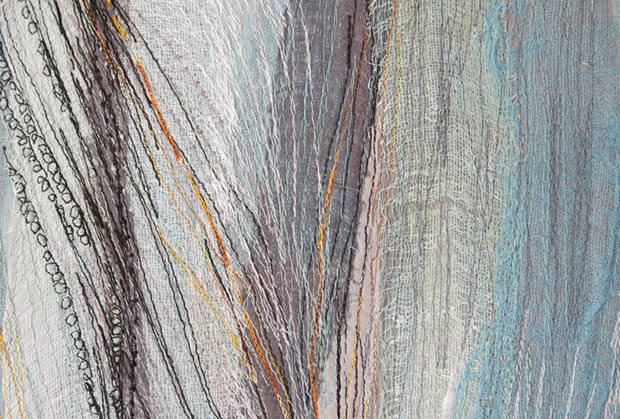 SINCE GRADUATING FROM THE METROPOLITAN UNIVERSITY OF MANCHESTER WITH A BA DEGREE IN EMBROIDERY, Lesley has worked extensively with textiles, collaborating with interior designers throughout Europe while also working on her own individual projects. As Lesley herself says, her work has, over time, become less overtly ‘commercial’, but has moved instead towards a more personal and profound – but no less accessible – vision, evident throughout her portfolio. ALTHOUGH LESLEY’S BODY OF WORK DISPLAYS A HEALTHY THEMATIC DIVERSITY, her pieces are unified by a singular desire: to make a statement. The messages are there in every example of her artwork, elusive, hidden beneath the textured layers, painstakingly pieced together. Her inspiration stems from the art of the ‘ancients’, a culture defined by the rich language of symbolism developed in order to communicate ideas. The creative community of that time felt a connection with the energy of the earth and resolved to express this connection through art – an endeavour mirrored all these generations later in Lesley’s own artistic creations.